Our Lady of Sorrows (Latin: Beata Maria Virgo Perdolens), the Sorrowful Mother or Mother of Sorrows (Latin: Mater Dolorosa, at times just Dolorosa), and Our Lady of the Seven Sorrows or Our Lady of the Seven Dolours are names by which the Blessed Virgin Mary is referred to in relation to sorrows in her life. As Mater Dolorosa, it is also a key subject for Marian art in the Catholic Church. The Seven Sorrows of Mary are a popular devotion. 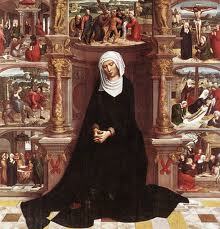 There are devotional prayers which consist of meditation on her Seven Sorrows. Examples include the Servite rosary, or the Chaplet of the Seven Sorrows of Our Lady and the Seven Joys of Mary. The Seven Sorrows (or Dolors) are events in the life of the Blessed Virgin Mary which are a popular devotion and are frequently depicted in art. Mary meets Jesus on the way to Calvary. Originating in the seventeenth century, the feast was extended to the whole of the Latin Church in 1727. It was originally celebrated on Friday in Passion Week, one week before Good Friday. INTROIT Psalm 30:10, 16, 18. Have pity on me, O Lord, for I am in distress; rescue me from the clutches of my enemies and my persecutors. O Lord, let me not be put to shame, for I call upon You. Ps 30:2 In You, O Lord, I take refuge; let me never be put to shame. In Your justice rescue me. Have pity on me, O Lord, for I am in distress; rescue me from the clutches of my enemies and my persecutors. O Lord, let me not be put to shame, for I call upon You. Graciously pour forth Your grace into our hearts, we beseech You, O Lord, that, keeping our sinful inclinations under control by self-denial, we may suffer for a brief while rather than be condemned to everlasting punishment. Through Jesus Christ, thy Son our Lord, Who liveth and reigneth with thee, in the unity of the Holy Ghost, ever one God, world without end. R. Amen. EPISTLE Jer 17:13 – 18. In those days, Jeremia said: O Lord, all who forsake You shall be in disgrace; the rebels in the land shall be put to shame; they have forsaken the source of living waters, the Lord. Heal me, Lord, that I may be healed; save me, that I may be saved, for it is You whom I praise. See how they say to me, ‘Where is the word of the Lord? Let it come to pass!’ Yet I am not troubled, following You as my shepherd; the day without remedy I have not desired. You know what passed my lips; it is present before You. Do not be my ruin, You, my refuge in the day of misfortune. Let my persecutors, not me, be confounded; let them, not me, be broken. Bring upon them the day of misfortune, crush them with repeated destruction, O Lord, our God. My enemies spoke peaceably to me: and in anger they afflicted me. V. You, O Lord, have seen; be not silent; be not far from me! O Lord, deal with us not according to our sins, nor requite us according to our crimes. Ps 78:8-9 V. O Lord, remember not against us the iniquities of the past; may Your compassion quickly come to us, for we are brought very low. kneel V. Help us, O God, our Savior, because of the glory of Your Name, O Lord; deliver us and pardon our sins for Your Name’s sake. GOSPEL John 11:47 – 54. At that time, the chief priests and Pharisees gathered together a council against Jesus, and said, What are we doing? for this man is working many signs. If we let Him alone as He is, all will believe in Him, and the Romans will come and take away both our place and our nation. But one of them, Caiphas, being high priest that year, said to them, You know nothing at all; nor do you reflect that it is expedient for us that one man die for the people, instead of the whole nation perishing. This, however, he said not of himself; but being high priest that year, he prophesied that Jesus was to die for the nation; and not only for the nation, but that He might gather into one the children of God who were scattered abroad. So from that day forth their plan was to put Him to death. Jesus therefore no longer went about openly among the Jews, but withdrew to the district near the desert, to a town called Ephrem; and there He stayed with His disciples. Blessed are You, O Lord; teach me Your statutes. Let not the proud oppress me; so shall I have an answer for those who reproach me. Grant us, O merciful God, that we may ever have the grace to serve Your altars worthily, and may we be saved by constantly partaking of the sacrifice. Through Jesus Christ, thy Son our Lord, Who liveth and reigneth with thee, in the unity of the Holy Ghost, ever one God, world without end. R. Amen. Give me not up, O Lord, to the wishes of my foes; for false witnesses have risen up against me, and such as breathe out violence. May the abiding protection of the sacrament we have received, O Lord, never forsake us, and always keep us from all things harmful. Through Jesus Christ, thy Son our Lord, Who liveth and reigneth with thee, in the unity of the Holy Ghost, ever one God, world without end. R. Amen. Let us pray. Bow down your heads before God. Grant, we beseech Thee, almighty God, that we who seek the grace of Thy protection, being freed from all evil, may serve Thee with a quiet mind. Through our Lord Jesus Christ, Who livest and reignest, with God the Father, in the unity of the Holy Ghost, one God For ever and ever. R. Amen.